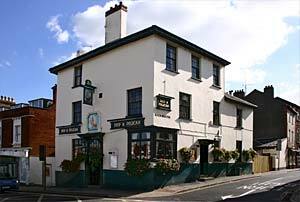 Along with the Horse and Groom on the opposite corner, the Ship & Pelican is the oldest public house in Heavitree, dating back to at least 1740. The 1870 Education Act brought about many new schools, which were used for public functions. Before this date, the Ship was used for public functions. The annual distribution of cloth to the poor from the Ship, lasted until the 1820's. Also, until the 1820's an allowance of 3 shillings (15 pence) was paid out of public funds for refreshments after a paupers funeral. 1967 - Ship Inn, 54 Fore st, Heavitree. There must have been a renumbering of Fore Street. The Ship Inn issued 1½d copper tokens from 1890 when it was part of Algar and Crowson's Windsor Brewery Group. 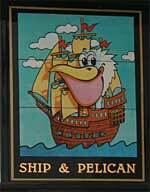 The name was changed to Ship and Pelican in the 1980's and it is a Grade II listed building. It is a wireless hotspot for the internet.